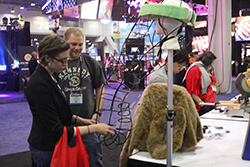 USITT Tech Expo displays creative solutions to production problems. Every other year, this exhibit highlights the work of technicians from all areas of production including sound, rigging, costume, crafts, properties, mask making, lighting technology, stagecraft, and special effects. An article describing, in detail, the products and processes used to develop the idea, accompanies each exhibit. The articles are assembled into a catalog which is sold at the Conference, online, and by the USITT Office. The application deadline is Oct. 14. Apply here. Find guidelines and more info at www.usittshow.com.tech-expo.